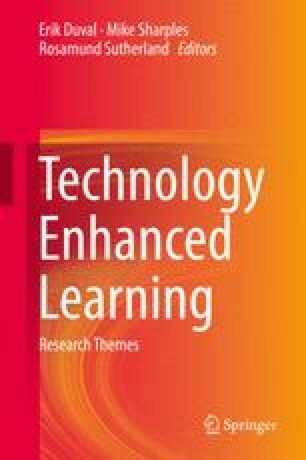 The focus of research in mobile learning has shifted from “anytime anywhere” delivery of educational content on mobile devices towards understanding the mobility of learning, as learners move among locations, times, objects and social interactions. Within a classroom, mobile technologies can support new forms of collaboration, with students shifting from working individually on a problem to creating a group solution, then sharing that with the class. More broadly, learners equipped with personal devices such as smartphones and tablets can start to connect learning experiences at home or outdoors with their formal education. A central concern of research in mobile learning is to examine the relations between learning and context. Beyond the classroom (e.g., on a field trip or a visit to a museum) constraints of space, curriculum and timetable are reduced, so learners may have to establish “micro-sites” for learning out of available locations and resources, supported by mobile devices. The mobile technology becomes a facilitator of conversations and interactions within and across locations. A further progression is for educational technology to become embedded in locations, with “smart” objects forming a ubiquitous technology-enabled learning environment: for example, buildings that teach about energy usage, or household objects that describe themselves in a foreign language. A vision for the future is to support people in a lifetime of learning as they explore the natural and created world.